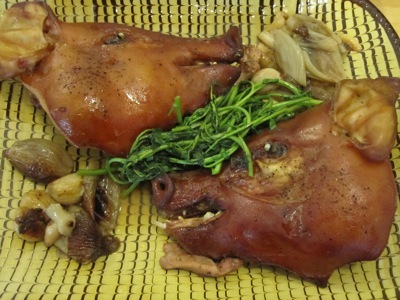 I say only half a head, as it is a perfect romantic supper for two. 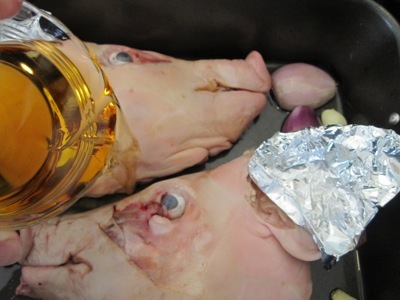 Imagine gazing into the eyes of your loved one over a golden pig’s cheek, ear and snout. I began by shaving the bristles off the halves, a task made easier due to the little fellow’s tender age. 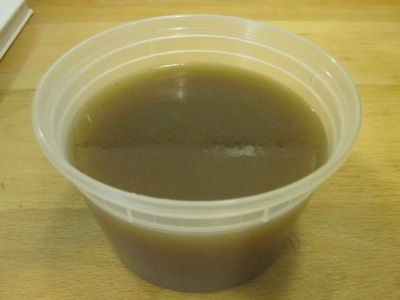 Then I assembled my ingredients: a “dollop” of duck fat, eight whole peeled shallots (I only had three, but they were huge, so I halved them), eight peeled garlic cloves, brandy, and a quart of chicken stock. Not shown: some white wine, a bunch of watercress and “a healthy spoonful” of Dijon mustard. 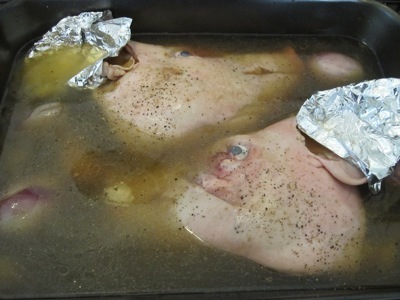 Dollop the duck fat into an oven tray wide and deep enough to accommodate your half a pig’s head and put it in the heat. 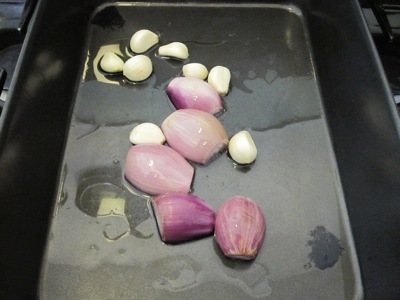 Add the shallots and garlic and leave them to do a little sweating to improve the flavor of the dish. Shuggle the tin occasionally to prevent any burning, but you do want some colour. When happy with these, cover the ear of your demi-head with foil so it doesn’t frazzle, then rest the head in the tin. 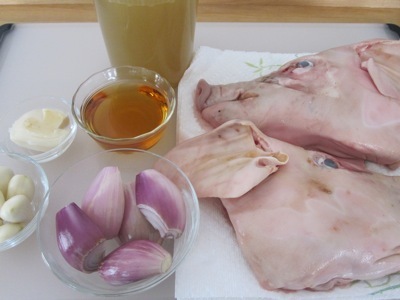 … nustle in your bundle of joy [thyme and rosemary], add the wine and then the chicken stock. 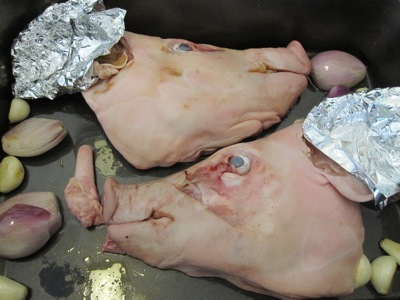 Now, I’m sure we have covered this before — the alligator-in-the-swamp theory — what we are looking for is half the pig’s head to lurk in the stock in a not dissimilar fashion to an alligator in a swamp. Season with salt and pepper, cover the tin with greaseproof paper, offering some protection but not denying the rigours of the hours to come in the oven — which is where you should now put your tin, in a medium [350° F] oven for three hours, until the head is totally giving. 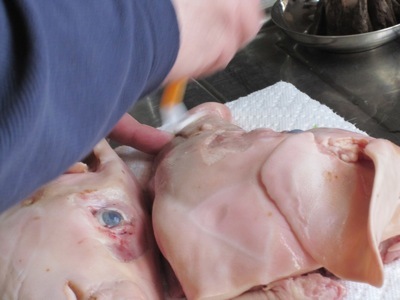 Check it after 2-2 1/2 hours; you could remove the greaseproof paper at this point and get a little colour on your cheek. When ready, remove the head to a warm place. 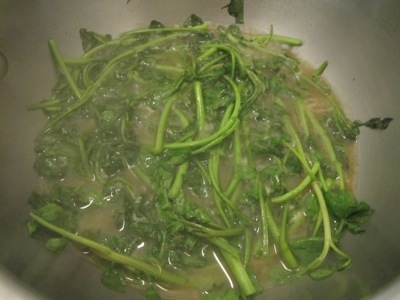 Whisk the Dijon mustard into the pan liquor, in which you should then wilt the watercress. 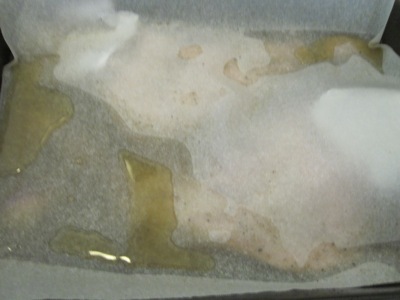 I removed a few ladlefuls of the pan liquid to a saucepan, added the mustard, and wilted the greens. Finally, on the head presentation platter, make a pillow of shallots, garlic and wilted watercress, where you then rest your head. There you have it, diner for two; open something red and delicious: Moon, June, Spoon. 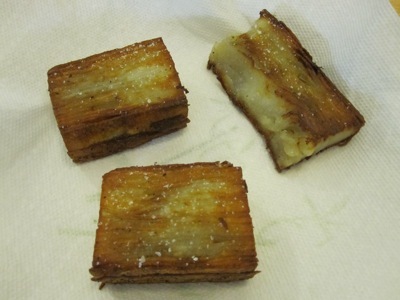 I crisped some of the left over potato mille-feuille from the previous evening to accompany the pork and veg. 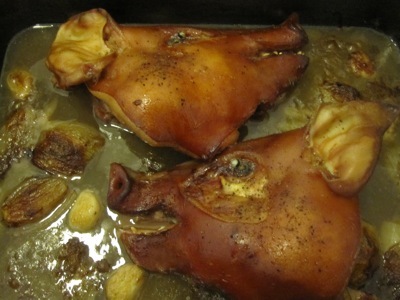 Since I know my way around a pig’s head, I carved at table-side, making sure to serve the cheek and crispy skin to She Who Must Be Obeyed. He Who Will Not Be Ignored demanded — without any prompting — the ear and snout. There was just enough actual meat to feed the three of us, a meal that quickly devolved into a frenzy of slurping, crunching, and lip-smacking. And if that isn’t romantic, I don’t know what is. And the remaining cooking liquor? Liquid gold, strained and stored in the Belm Utility Research Kitchen Deep Storage Facility.